Everyone is welcome at The Core. 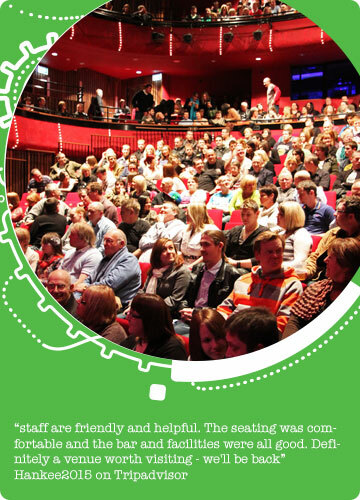 This is your venue and we want to make sure you are as comfortable as possible during your visit. The entrance to The Cube is located on Parkland Gateway off George Street. From here you can access all three levels of The Theatre: the Gallery, Circle and Stalls. The Gallery is located on the ground floor and there is a lift available to access Circle and Stalls levels. You will be welcomed by one of our brilliant team of volunteers who can help find your seat and can also direct you to The Lab or The Base, both accessible from The Core’s foyer spaces. We have bars on both Stalls and Circle levels where you can enjoy a pre-show and interval drink. Both bars have extensive standing and seating areas and a wide range of drinks and snacks to suit every budget. Our bars and spaces are accessible to those with disabilities. With our commitment to being a family friendly venue, The Core provides free buggy storage and cloakroom, baby changing facilities, a microwave to warm baby food and a very warm and family-friendly welcome. There are also activities available in the bar to entertain whilst waiting for the auditorium to open and soft play mats for use. If you can think of anything we can do to make your visit more enjoyable, please don’t hesitate to contact us.